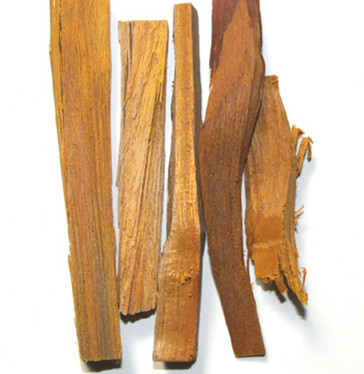 The dry heartwood of tree or bush Caesalpinia sappan L. of family Pulse. Guangxi, Guangdong and Taiwan provinces in China. Light smell and lightly astringent. Big, firm, red and yellow. Planed into thin chip or split into small piece or smashed into rough powder. Sweet, salty, pungent, neutral; heart and liver meridians entered. Activate blood and cure trauma, dispel stasis and dredge meridians. This herb can activate blood, cure trauma, resolve swelling and alleviate pain. For traumatic injuries, bone fracture, soft tissue injuries, swelling and pain due to stasis, it is used internally and externally. 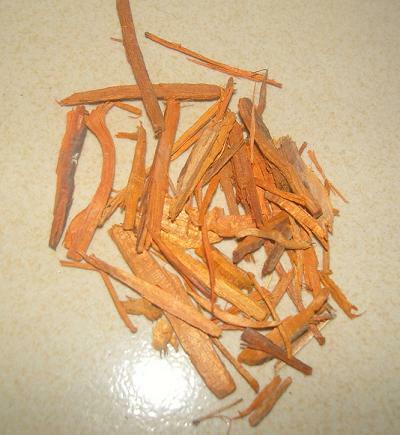 It is one of the most commonly used herbs in traumatology. It is usually combined with blood-activating and trauma-curing analgesics orally. For instance it is combined with Ru Xiang, Mo Yao and Zi Ran Tong, etc. in Ba Li San from Yi Zong Jin Jian. It is also made decoction with blood-activating and swelling-resolving analgesics such as Liu Ji Nu and Ze Lan, etc. to fumigate the affected region. B. Amenorrhea due to stasis, dysmenorrhea, postpartum abdominal stagnant pain, abscess, sore and abscess. This herb can dissolve blood stasis, resolve mass, dredge menstruation and alleviate pain indicated for amenorrhea due to stasis, dysmenorrhea, postpartum abdominal stagnant pain, heart and abdomen stagnant pain as well as mass. For gynecological menstrual and partal diseases caused by stasis such as amenorrhea, dysmenorrhea, postpartum abdominal stagnant pain and so on, it is decocted singly or combined with blood-activating and stasis-dispelling herbs and menstruation-regulating analgesics such as Chuan Xiong, Dang Gui and Hong Hua. For abscess, sore and abscess resulted from internal stagnation of heat-toxin and accumulation of qi and blood, it is also used to move blood and dispel stasis, resolve swelling and alleviate pain. For instance it is usually combined with heat-clearing and toxicity-relieving herbs and swelling-resolving analgesics such as Jin Yin Hua, Lian Qiao and Bai Zhi. Decoct 3~10g. Proper dose for external application.